Again, the CSA is getting me to think differently – which is a really good thing. It’s part of what I hoped would happen, that I’d branch out and try new foods. Now, it’s not like I’ve never EATEN fries and never MADE fries, but by “made” I can say that I had only ever heated up fries from a bag that came from a freezer. Until now. To say that this recipe is easy would be an understatement. It’s stupid-easy. It’s “I can’t believe it took me this long to make my own fries” easy. You can make these plain or add your own topping, once the fries are done cooking. We chose to add rosemary and garlic powder to ours, and they were OMNOMNOM good. My next topping will likely be garlic – and I’ll list what needs to be done to make those, too. Make sure to pick potatoes that are sized to your preferred length of fry. Ours were the CSA potatoes, which were on the small side. They made delightful fries, though I can imagine that people who revel in the longer fries might have wished for bigger ‘taters. Updated on October 9, 2011 to add: Note that I recommend using olive oil. If you want your fries to have a more conventional taste, go with vegetable oil instead. After a lower-than-anticipated acceptance rate from the little people of the house, I made a small batch with vegetable oil instead. Presto-change-o…they love ’em! 2. Slice the potatoes into strips about 1/2in thick. Cover in water and soak for 10 minutes. 3. Drain and dry the fries. Drizzle a small amount of olive oil over top of the fries and toss to coat. Make sure that all of the fries are coated with a thin layer of oil. 4. 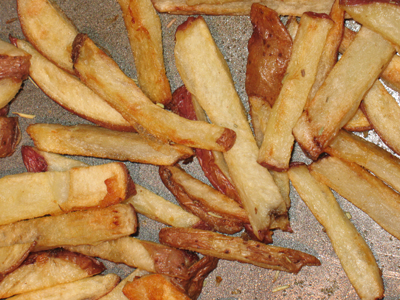 Lay the fries out on a non-stick baking sheet, one layer thick and place in the oven once it’s preheated. 5. Cook the fries for 35-40 min, to desired crispness, turning them every 10 mins. 6. After you remove the fries from the oven. grind or shake a small amount of salt on them. Rosemary & garlic: sprinkle about 1 tsp dried rosemary and 1-1/2 to 2 tsp garlic powder on the fries; toss to coat. Garlic: peel and mince 3 cloves of garlic; briefly heat (2 min) in about 1-2 Tb olive oil. Pour over the fries and toss to coat. LOVE, LOVE, LOVE oven baked fries!! I am actually making oven baked sweet potatoes tonight with olive oil, Italian seasoning, and Parmesan cheese. YUM! !